Similar Species: There are 16 US species of Pyractomena, with two yet to be described. 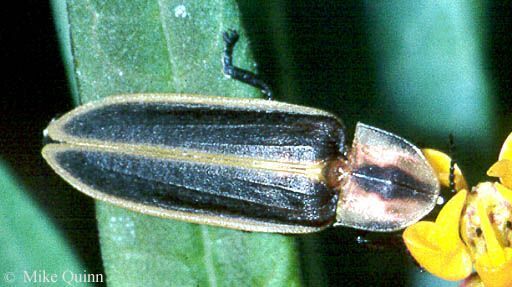 Biology: Fireflies prefer moist areas. Larvae are carnivorous, feeding on other insects, snails, and slugs. Taxonomy: This genus is sometimes misspelled as Pyractonema, which is a South American genus. Archangelsky, M. and M.A. Branham. 1998. Description of the Preimaginal Stages of Pyractomena borealis (Randall, 1838), and Notes on Its Biology (Coleoptera: Lampyridae). Proc. Wash. Ent. Soc. 100(3): 421-430. Green, J. W. 1957. Revision of the Nearctic species of Pyractomena (Coleoptera: Lampyridae). Wasmann Journal of Biology 15: 237-284. Lloyd, J.E. 2003. On Research and Entomological Education VI: Firefly Species and Lists, Old and New. Florida Entomologist 86(2):99-113.